Although business process (re)design is often the 1st step when looking for process innovation and process improvement, it is often the implementation of the (re)designed processes – and keeping the implemented improvements sustainable – that are the most challenging. Many studies also have shown that organisation wide projects, including enterprise wide software implementations – e.g. ERP, CRM, SCM, etc. – , failed due to a deficient change management. Since business processes often cross many functional departments, no one will deny that process changes are also organisational changes. Hence, let us first have a look at some main change management frameworks or models reflecting the process of change. This may help you to increase the chances for your process management related projects to be successful. You will also read about the levels and causes of resistance to change and how to manage these. 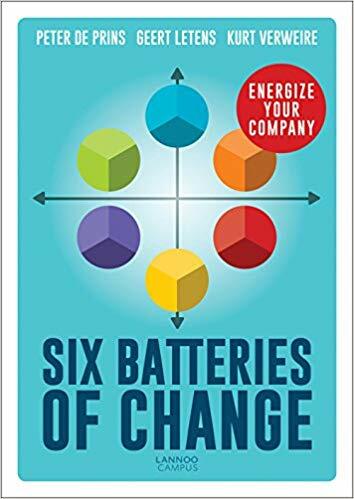 Finally, the blog concludes with the 6 batteries of change, actually critical success factors for organisational change. The first step that leaders need to take is to emphasise – or even to generate – the need for change. Thus the urgency and the importance of the change – e.g. for the organisation to survive, to improve processes, to increase customer satisfaction, to grow, etc. When your company is losing market share because of a loss of competitive advantage for instance, then you need to make the entire organisation very clear that its future is in real danger if nothing will be done. This is a key step to create the overall support needed for the coming change. Why would staff support a big change if they do not see or feel the need for it…? Successful organisation-wide change can never be the result of one single person. Hence, it must be driven by a team of early and strong believers. Go-getters who will be able to boost the “change energy” through the entire organisation and who will guide, coordinate, and communicate the activities needed to implement the change. To facilitate people to support and to co-execute the change, you need to make sure that the vision of the future organisation is clear and could be understood by everybody. This vision should also be aligned through the entire organisation. This means that everybody should understand what his/her job will look like within the future organisation. The more concrete, realistic and tangible the vision is, the more easy it will be to get the ‘buy-in’. communication should be bi-directional rather than one-way, top-down communication. By listening carefully, you will discover possible unforeseen obstacles (which would lead to resistance to change anyway if not taken seriously). 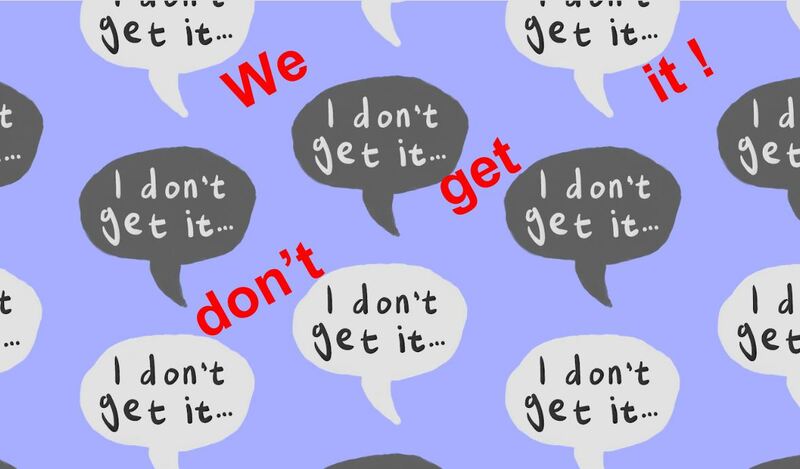 you better ‘over-communicate’ than ‘under-communicate’, making sure everybody gets the message. As you will read further, some communication should be personalised. the guiding team should lead by example, thus walking their talk. Especially when change implies some sacrifices, they should make clear that they are the first ones to go for it. How could you empower people better than by carefully listening to them, by understanding why the change may be a challenge for them and by supporting them where needed, so to remove the obstacles to change. Obstacles may be very various: from mental barriers to existing structural barriers like operational or information systems that could become outdated due to the change, operational procedures which will need to be updated, new skills that are required, etc. Early results that will help to prove the benefits of the change efforts (so far), will obviously energize employees even more to proceed with the achievement of the total change. This not only means that you should plan and select (and prioritise) short-term wins, but also that you should widely communicate about these intermediary benefits through the entire organisation. Whatever big or small these short-term wins are. This helps to build faith in the change project, and it provides feedback which emphasises the rewards for people’s efforts. After some first successes, the risk might be that (some) people start to “let it up”. Hence the guiding team needs to keep the momentum, e.g. by fostering the new culture of positive behavior. It should also be relentless, until the vision (see step 3) has become reality. To make the change sustainable, it should get embedded in the organisation’s culture. New behaviors should become new habits. For example by rewarding people for the improved results and behavior, by further listening to possible (new) obstacles which appear, etc. 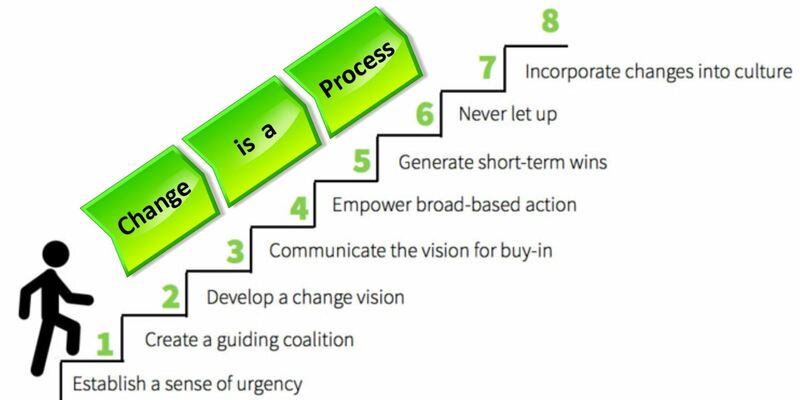 Similarly to Kotter’s 8 steps, the ADKAR model also represents a change process where you should not omit any step. And as you will notice, even though the number of steps is less (5 instead of 8), they are content-wise pretty close to Kotter’s steps as well. For an organisation to change, people should be aware of the need – say the why – to change. People thus need to understand the nature and the reasons of the change. Comparable to Kotter’s “Sense of urgency”, isn’t it? Managers cannot force their staff to support – and particularly to engage – in ‘their’ changes. That’s why awareness (of the need for change) is not enough. People should also know the nature of the change and its impact(s) for them personally, say the “what’s in it for me”. As a change agent, you should look after the personal situation of the several stakeholders, and find out which intrinsic motivators may generate the desire for change. Even once everyone accepts and wants to change, it will not happen without further efforts. People should understand how to implement – or contribute to – the change. Among others, they need to be trained on hard and soft skills, on newly to acquire behavior, on how to use new or renewed processes and tools, etc. Though they also need to know and to understand their new role(s) & responsibilities within the renewed organisation. Knowledge is also not sufficient yet to get the change done. People also need the abilities to implement the change. While the previous step’s emphasis was on training, ability rather means that people need to become (cap)able to act and to behave according to the changed situation. It is not because you have been trained to use a new system or machine that you will be able to use it perfectly from the first time. Just like you will not be an experienced tennis player after only have learned the game rules. This includes any action or event which helps reinforcing the change. Either with the individual or with the entire organisation. Reinforcing actions tell people that they – and their efforts – were important to the changed organisation. They help people to keep doing things – and to behave – the new way, and thus to reinforce the change. Mind that reinforcement initiatives also help to improve your organisation’s change culture : when leaders appreciate and reward people for their efforts, the chance that these same people will be even more willing to support future changes will increase, indeed. Maurer’s levels describe the main causes of resistance to change, and how to deal with those. In other words, how to make critical people into allies of change. This is the innocent kind of resistance, for example when people lack information or when they get confused over the meaning of facts, figures or any other type of information. Or when they do not agree with the information which has been communicated. Obviously, the solution to this type of resistance is to find out why people don’t get it. As people all have their way of perceiving information according to their personal opinions, experience, skills, education,… you should adapt your communication accordingly. Level 2 is an emotional type of change, based on fear. For instance fear for the loss of control, status or even the loss of their job. This is a deeper level of resistance, and often “masked” by level 1 resistance. As managers very rarely encourage people to get emotional, the resistance providers will suppress their emotions and will thus communicate in a similar way as for the level 1 type of resistance. They may even not be aware themselves of the fact that their resistance is of emotional nature. Needless to mention that this level 2 resistance is more challenging to be managed, as a rational approach will not help here. The solution is to tackle the cause, i.e. to remove the fear. E.g. by emphasising the benefits of the change for the organisation, though particularly for themselves. Involving them in the change process is also key to making their fear disappear. Of course, as a manager, you will need to stay honest so to avoid any feeling of manipulation – what obviously will make the resistance even worse. In this deepest kind of resistance, people are actually not resisting the change idea or plan. They might even love it, though they resist the manager(s) who want to make the change happen. Not necessarily their direct manager. Unfortunately, according to Maurer, this is the major reason of resistance to change, and thus also one of the most common reasons why changes fail. And as you may imagine, people will not tell this straightforwardly and very honestly to you. This is obviously the most challenging resistance to solve. Not only because it is the hardest to identify, though also because trust comes on foot while it leaves on horseback. And (re)establishing the trust is the only correct way to respond to this kind of resistance. You will find more on Rick Maurer’s vision and tools for change on his website. a clear strategic direction : change leaders must define a clear winning strategy : not only what and how the organisation should do in the future, and whom (i.e. which customers) it should serve, though also what not to do and whom not to serve. They obviously also should explain the ‘why’ of this choice. a powerful management infrastructure : organisational change obviously affects (management) systems and structures – what the authors call management infrastructure. The management infrastructure should support the (new) strategic goals ; it should certainly not be the opposite. Even though existing management structures too often brake the change. 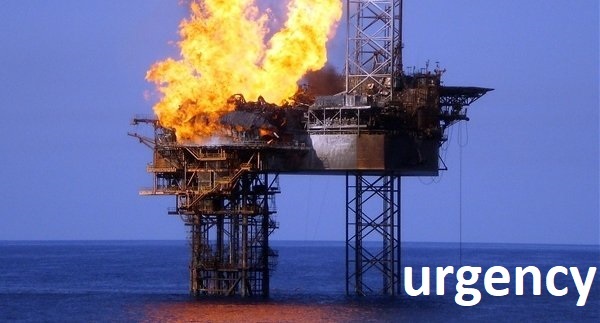 an action planning and an effective implementation : as already stated in this blog, plans – either strategical, tactical or operational – only have value when they are implemented. Unfortunately, still too many managers underestimate – or even ignore – the operational side, say the rollout, of change. a cohesive top team with shared ambition : a profound organisational change requires a team at the top, aiming at a common goal. Any divergence at the top may cause a change failure. a sound (change) culture and climate : without a thorough understanding of your organisation’s culture, it will be very hard to successfully implement the change and to win the hearts & minds of the people. a strong connection with the employees : no organisational change can be accomplished without the commitment from employees. Hence, leaders have to find out what motivates each individual staff member. To achieve this, local sponsors – taking up the responsibility for the change in their specific areas – are essential as ambassadors of change. The authors vision is that each of these batteries should be sufficiently loaded. If empty (or missing), they will drain the energy needed for the aimed change, actually leading to no – or a poor – change. In other words, these are 6 critical success factors for (organisational) change. Please share your experience with – or any interesting comment about – change management in below Comments box, and get inspiring documents on change management. P.S. : If you found this information useful, don’t hesitate to share it with your Facebook friends and fans, LinkedIn contacts, Twitter followers and Google+ circles, through the share buttons below. Thank you! Only efficient and agile organisations will survive and be successful by achieving more growth, a higher market share and more profits than their competitors. I want to help you optimise your business processes by focusing on your market, strategy and value chain and I will ensure that your team will continue to improve your business processes afterwards.